The novelty is released in honor of Colin Chapman - a famous British car designer, who in 1952 founded the company «Lotus Cars», and since 1958 put his own team "Lotus" in the "Formula 1". He has introduced many innovative solutions in the design of racing cars. The creators of the unique Silverstone Stowe GMT Chapman watch paid tribute to the Golden Age of racing cars. At this time, for the design of the model are chosen bright colors - green and yellow, which immediately attract the attention. The Silverstone Stowe GMT Chapman watch is presented in 48 mm round case, made of stainless steel. The case has a black carbon fiber bezel. The black dial, made of carbon fiber, has Arabic numerals with a yellow phosphor coating, hour and minute hands coated with white fluorescent substance and a yellow second hand. The separate minute counter with a green ring is placed at the 3 o’clock position. The black tachometer scale is on the outer ring of the dial. The second time zone indication is carried out by means of the black central hand, which has a white tip in the form of a triangle with a red outline. To display a second time zone in the outer ring the dial is marked with green white figures. A small window with a 60-second counter is set at the 9 o’clock position, and at the 6 o’clock position is placed the date aperture. The dial is protected by a convex double-sided anti-reflective sapphire crystal. The screw-down crown is placed at the 3 o’clock position and surrounded by two chronograph buttons. The transparent case back allows you to enjoy the work of the manufacturing automatic mechanism G1721 at 28 jewels, with a frequency of 28,800 vibrations per hour, power reserve of 48 hours. The caliber is equipped with features of hours, minutes, seconds, chronograph, date display, second time zone and flyback functions. The novelty comes on a black rubber strap with yellow inserts or steel bracelet. The new Silverstone Stowe GMT Chapman watch is released in a limited edition - 500 items. To buy the watch is possible for 9900 Swiss francs. 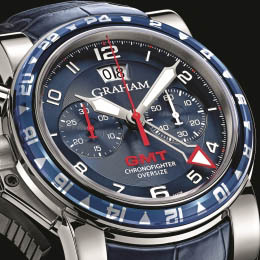 Official website of Graham watches.